What’s the average nurse salary or hourly wage? 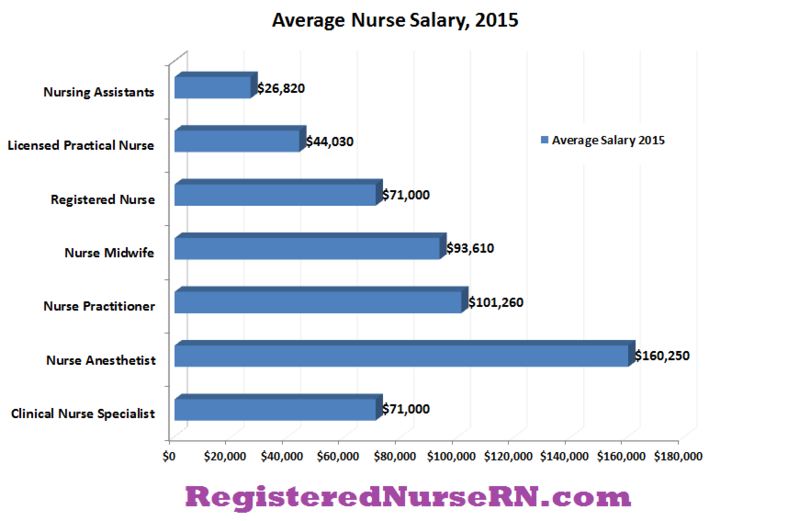 How much money does each type of nurse make? Those are great questions. While most nurses don’t enter the profession for the money, they still have bills to pay. Many nursing students are interested in knowing what they can expect to earn each year, and nurses currently working in the profession might want to see how they compare to national averages. In this article, we’ll cover the latest salary statistics as of 2015 for the different types of nurses (not including individual specialties). We’ve included nursing assistants, licensed practical nurses (LPNs), registered nurses (RNs), nurse midwives, nurse practitioners (NPs), nurse anesthetists (CRNAs), and clinical nurse specialists (CNS). First, let’s take a look at the average salaries for the different types of nurses, based on statistics from the Bureau of Labor Statistics in 2015. All of these figures are just averages, and you may make more or less than these amounts based on your experience, the state in which you live, the industry in which you work, and so forth. While some states may consistently offer higher salaries (such as California), you should also take into account factors such as the cost of living (state taxes, real estate costs, utilities, etc.). In addition, New grads probably won’t make as much as a seasoned nurse with years of experience (or in management positions). Nevertheless, these figures can help you get an idea of nursing incomes. We included nursing assistants in this graph since many of our viewers work in these positions. They earned an average of $26,820 per year. LPNs came in next at $44,030. RNs earned an average of $71,000 per year, followed by midwives who earned $93,610. Nurse practitioners earned an impressive $101,260, but nurse anesthetists earned the highest average salary: $160,250. Finally, the Bureau of Labor Statistics did not segregate clinical nurse specialists into their own category. They were lumped together with the registered nurses, earning an average of $71,000 per year. Other estimates outside of the Bureau of Labor Statistics suggest that clinical nurse specialists earn closer to around $84,000 per year. Nursing assistants earned $12.89 per hour, whereas LPNs earned an average of $21.17 per hour. Registered nurses earned $34.14, while midwives earned $45.01. 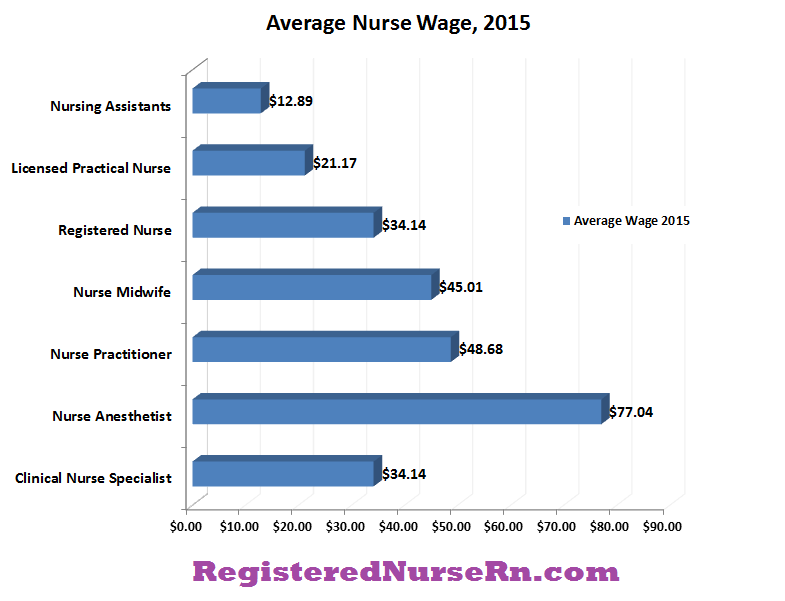 Nurse practitioners pulled in $48.68 on average, but the top earner was again nurse anesthetists at $77.04 per hour. Clinical nurse specialists were again lumped with regular RNs ($31.14), but may have earned closer to $39 per hour on average had they been separated into their own category. Tasks: Nursing assistants work under the direction of LPNs and RNs. They act as support staff and provide patient care such as bathing and hygiene, taking vital signs, and much more. Education Level: High school diploma (or equivalent), plus on-the-job training. Certification is available (takes about 2-6 months to become a CNA). Salary: They earned an average of $26,820 per year or $12.89 per hour in 2015. Job Growth: 17% projected growth rate between years 2014-2024, faster than the average for all occupations (7%). Top Paying States: Alaska: $37,300; New York: $33,390; Nevada: $32,710. Tasks: LPNs work under the supervision of healthcare staff such as registered nurses and doctors. They provide patient care by implementing doctors’ orders, administering medications, documenting, collecting vital signs, and more. Education Level: High school diploma (or equivalent), plus completion of an LPN program (takes approximately 12-16 months). Salary: They earned an average of $44,030 per year or $21.17 per hour in 2015. Job Growth: 16% projected growth rate between years 2014-2024, faster than the average for all occupations (7%). Tasks: RNs work under the direction of medical doctors, nurse practitioners, and other medical staff. Their skills include assessing, planning, implementing, and evaluating patient care. Education Level: High school diploma (or equivalent), plus an ADN degree (2-3 years) or BSN degree (4 years). Salary: They earned an average of $71,000 per year or $34.14 per hour in 2015. Tasks: Nurse practitioners order, perform, or interpret diagnostic tests, as well as prescribe medication. They work under the supervision of medical doctors. Education Level: High school diploma (or equivalent), BSN degree (4 years), plus master’s or doctorate degree. Salary: They earned an average of $101,260 per year or $48.68 per hour in 2015. Job Growth: 31% projected growth rate between years 2014-2024 for nurse practitioners, nurse anesthetists, and nurse midwives combined. Tasks: Nurse midwives provide specialized care to mothers and their babies, as well as other gynecological care. Salary: They earned an average of $93,610 per year or $45.01 per hour in 2015. Tasks: Nurse anesthetists administer anesthesia, help patients recover from anesthesia, monitor vital signs during procedures, and more. Salary: They earned an average of $160,250 per year or $77.04 per hour in 2015. Tasks: Clinical nurse specialists provide patient care, which includes treating illnesses and diagnosing patients. They also work as consultants, educators, clinical leaders, researchers, and more. Salary: They earned an average of $71,000 per year or $34.14 per hour in 2015. However, some estimates are closer to $84,000 per year or $39 per hour when segregated from other RNs. Job Growth: 16% projected growth rate between years 2014-2024 for RNs—the category that included clinical nurse specialists. Top Paying States (same as registered nurses): California: $101,260; Hawaii: $90,130; Massachusetts: $88,650.